Beach goers and boaters along the coast of Central California are accustomed to seeing fascinating sea creatures large and small off its shore—but an Arabian horse? Some at first thought the gleaming white animal bobbing up and down on the waves near Santa Barbara was a seagull, but were surprised to learn it was a equine model known as William, reports the Santa Barbara News-Press. The 6-year-old Arabian, whose full name is Heir of Temptation, was part of a photo clinic on the beach until it got spooked by ocean waves crashing on shore, and bolted, says owner Mindy Peters. The beautiful white stallion is valued at $150,000. But instead of running away from the waves, William charged them and swam two miles out to sea. 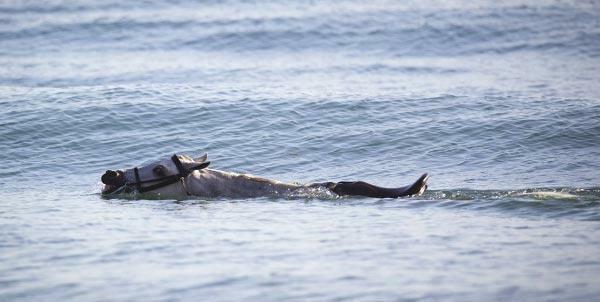 Rescue crews managed to corral the horse a mile offshore around sunset. William was taken to Alamo Pintado Equine Medical Center in Los Olivos. The horse was exhausted and had some water in its lungs but is doing fine. The animal managed to stay afloat despite having its long tail wrapped around one of its legs for almost three hours. Veterinarian Dr. Lisa Teske credits his breeding. "Being an Arabian, I think, has a lot to do with his endurance level. He's pretty fit."